Héctor Zamora’s work is alive. It is animated by its surroundings, often by the actual air in which it exists. 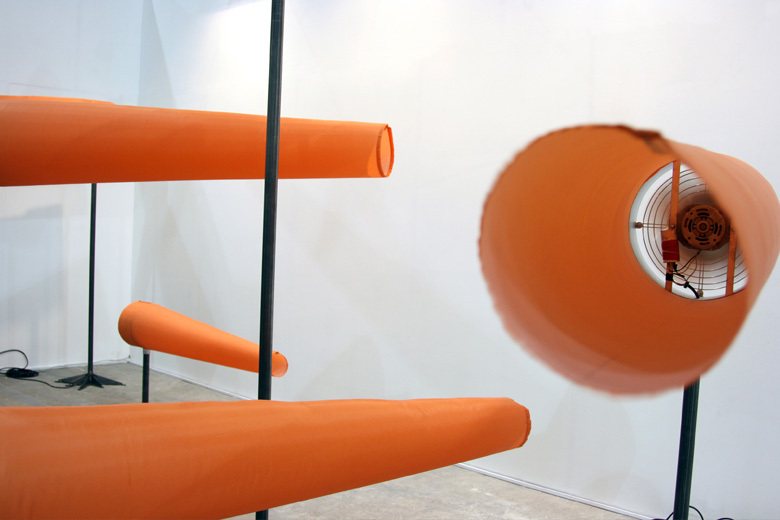 The use of air, or wind, as a material creates a direct interaction between the work and its site; a wind-powered piece is ultimately site-specific. Further, it forms a specific relationship between the viewer and the piece. Take Zamora’s Volatile Topographies (Pusan, South Korea, 2006), in which a net of red rope is made buoyant by thirty-seven giant spherical red balloons affixed to various intersections of the net. As the balloons slowly rise and fall in the wind, the “topography” of the net morphs, performing a geometrical dance as a visual representation of the wind’s activity. The viewer becomes aware not only of the wind activating the movement, but of the fact that this is the same wind in which the viewer himself is standing. Volatile Topographies is alive because it implicitly connects the viewer to the work, causing a certain self-awareness, and a new understanding of one’s own environment. Natural wind in an outdoor environment holds different implications than fabricated wind in a museum setting. 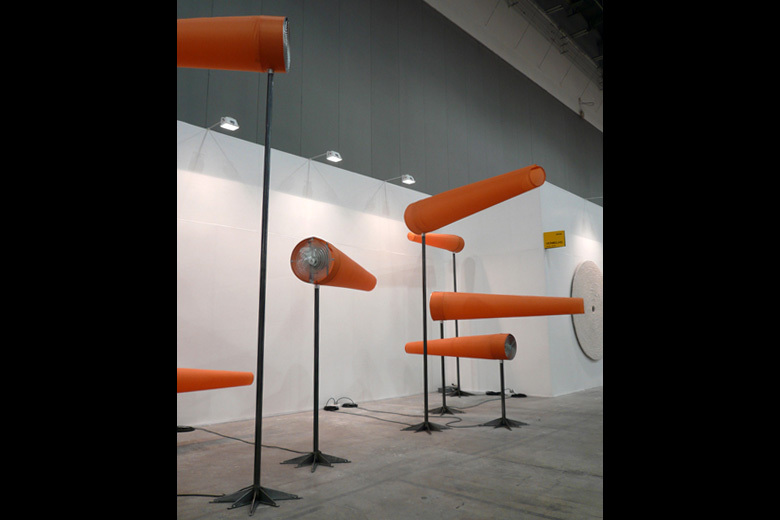 In a more recent work, Sensivel Perturbacao (São Paulo, Brazil, 2008), Zamora manipulated the environment of the closed gallery space using forty ceiling fans interspersed in the spaces between other artist’s work. There is no visible geometry in Sensivel Perturbacao, only the tactile experience of walking under the fans as they spin at different speeds. While this work has apparent connections to work by other artists incorporating fans, like Olafur Eliasson’s Take Your Time (2008), in its attempt to deconstruct the illusion of the white cube it bears strong ties to work such as Martin Creed’s infamous Work # 232 (2001), in which the lights in the gallery space were timed to switch automatically on and off every thirty seconds. 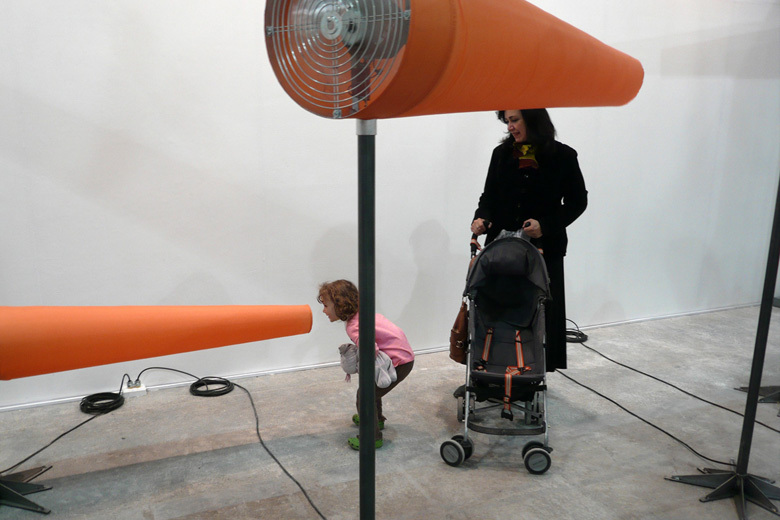 However, Zamora’s manipulation of air itself poses a particular set of questions related specifically to physical experience. We are made to consider the very physical quality of the wind; and the harnessing, or manipulation, of its complicated and invisible geometries. The geometries of moving wind become visible volumes in the work N NE E SE S SO O NO, which addresses the illusion of the natural in relation to the visibility of the wind. Eight wind cones of differing heights are blowing in the four cardinal and four secondary directions within an enclosed space. We can infer that the wind is caused by fans inside the cones, but the scene nonetheless comes as a surprise. 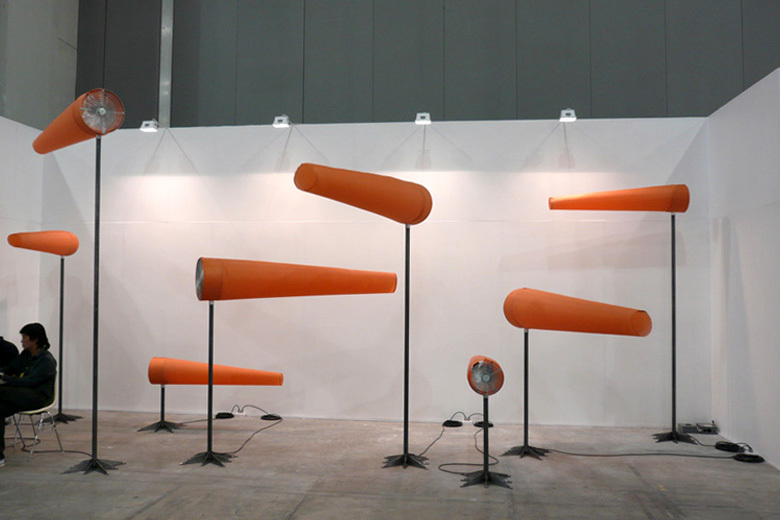 The functionality of the wind cones is subverted with both an aesthetic and a philosophical intent. A functional object is presented in a new and surreal way: it becomes unfamiliar, and in its unfamiliarity it becomes beautiful. Perhaps the root of the strangeness of the piece is in its confinement, the pointedly closed-off environment that makes the illusion so impossible. And of course there is the mystery of the cones’ differing directions, and the unexpected quality of life that they take on due to this individuality. Is the lie of life, we wonder, in fact a lie? Or would it be a lie to say that art has no life in the first place?